So why you should take a golf holiday in France? Where to start? When it comes to talking about the perfect golf holiday in France, we admit we’re a little bit biased. But it’s not without good reason. We’ve taken golf holidays in France and all over the world. And we think France is pretty hard to beat. Here’s why. 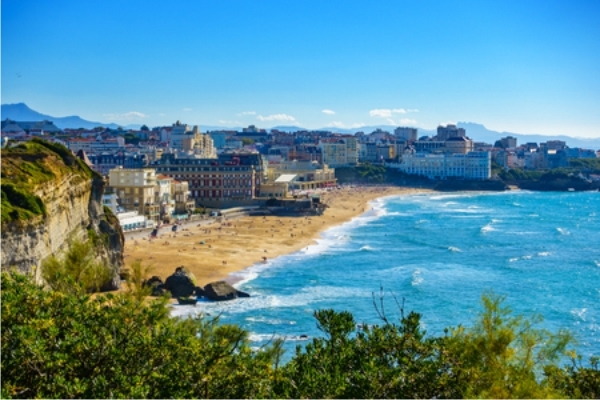 Biarritz in south-west France. You don’t have to go far in France to find wonderful beaches. You can play golf in France pretty much anywhere year-round, with the season lasting longer the further south you go. Even in the depths of winter it’s possible to get in a game in the south of France after the sun has warmed the frost. Here in Bordeaux, we play locally from the end of February through until early November, depending on the year. 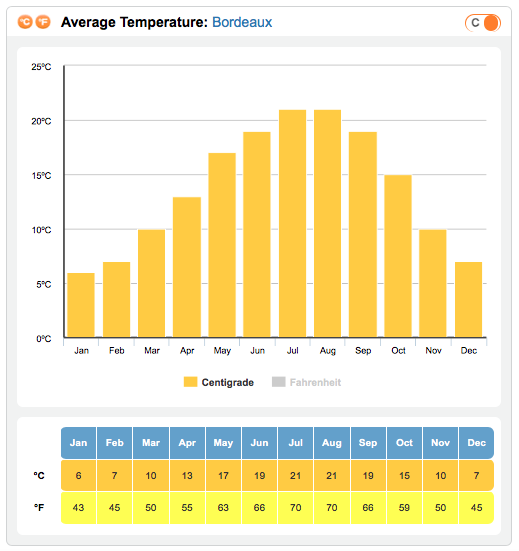 Here is the low/high temp chart for Bordeaux from Holiday Weather. We get lovely weather all year in Bordeaux. As you can see, it’s a nice balance. The summers are deliciously warm but too hot. You can play throughout the day with a hat and sunscreen and not end up with sun stroke. Meanwhile, the conditions are also pleasant throughout spring and autumn. Most of our golf in France is played in the south-west, in the area taking in Bordeaux, Biarritz and the eastern fringes of the Dordogne. That includes the wonderful Golf du Medoc course and the Tom Doak-designed five-star Grand Saint Emilionnais Golf Club – one of the newest golf courses in France. South of Bordeaux towards Biarritz, Golf d’Hossegor and Golf de Moliets offer links courses combined with a relaxed beach atmosphere. Golf de Seignosse, meanwhile, is a delight, with its fairways winding through forests of pine and oak. Away from the south west, there’s of course Le Golf National outside Paris, home to the 2018 Ryder Cup. One of our other favourite course is Les Bordes in Loire Valley. This is a members-only club, but during 2017 they’ve opened it to the public. (We can get you a tee time and put together a special package for you – just get in touch here). Unlike many club environments in the UK and the US, a golf holiday in France really is for all. It’s so much more relaxed here, both in terms of golf course etiquette and attire. There are no long waiting lists and it’s usually possible to get a tee time at short notice. While most courses officially require players to have handicaps, it is possible for holiday golfers to play some courses without one (just ask us if you don’t have a handicap and we’ll recommend the best course for you). As with etiquette, golf course prices in France are much more relaxed. The affordability factor means that it’s possible to with three or four rounds at different courses during a week-long stay for what you’d probably pay for one round at a top-ranked UK or US course. All our packages include tee times and green fees – just let us know how much time you’ve got and we’ll design a package for you. Foie gras is a French specialty. It’s a popular menu request from people taking a golf holiday in France. What golf holiday in France would be complete without indulging in some fabulous local food and wine? It’s the perfect 19th hole! France is renowned worldwide for its food and wine, with Bordeaux ahead of the pack on both fronts. 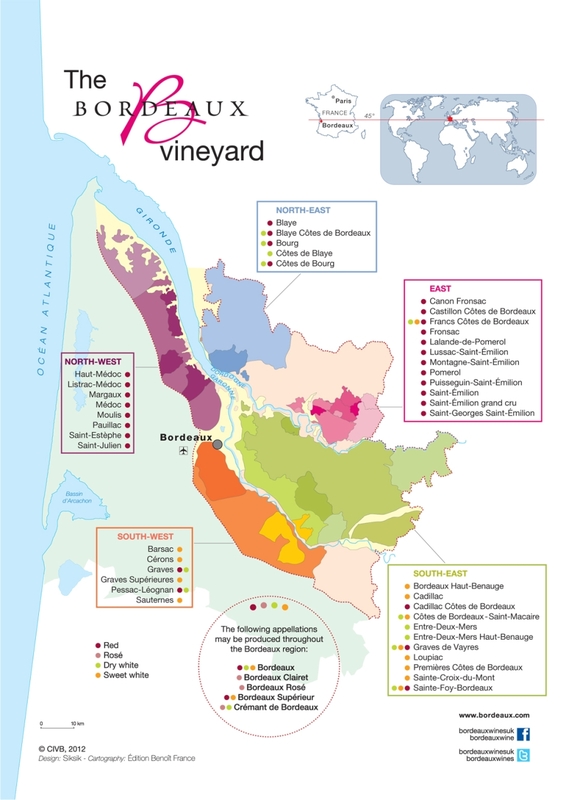 Bordeaux is and always will be the wine capital of the world, its famous map taking some of the most prestigious wine estates in the world. On the gastronomy front, the south-west of France is home to a swathe of culinary specialities. Not sure what ‘axoa’, la flaugnarde or lamproie à la Bordelaise are? Find out here! We can bring all these elements together to tailor the perfect golf holiday in France. Whether it’s a once-in-a-lifetime golf holiday or a weekend break, we’ll put together the perfect combination of golf, sun, food and wine just for you. Why not get in touch today?